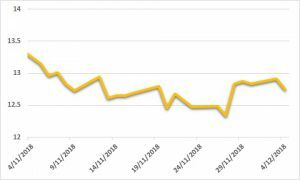 Along with oil prices, sugar prices look to have stabilised in the last week. Despite breaching a key 12.50 USc/lb level, sugar prices roared back toward 13 USc/lb later in the week. The prompt March19 contract was 37 points higher on the week. 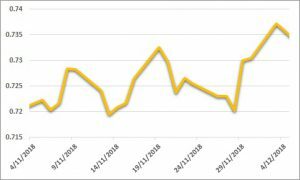 Perceived as a break for ethanol prices, Petrobras increased the price of gasoline on Friday night, however, sugar was unfazed by the announcement. With many of the northern hemisphere crops coming online now, much of the market’s attention will be focused there. Last week we heard the Indian harvest had kicked off, and whilst the industry has lowered its forecast, early harvest results look promising. Weather in Thailand remains fine, with no material variations expected. We expect the market needs more time to digest and analyse results out of the Indian and Thailand crops going forward. Outside macro influences will continue to drive prices and sentiment in the meantime. A big week for the AUD, following comments from the US Fed, which prompted a rally back above USD 0.73. Fed Chair Jerome Powell indicated a potential slowing of the Fed’s intended rate hike program for 2019. In a week with very little key information on the data calendar, Powell’s comments held much more attention by the market. The G20 summit held in South America over the weekend was highlighted by some developments on the trade front between China and the US. Both parties agreed to hold fire on more tariffs, as a 90-day window was opened to see if they can come to an agreement on their trade differences. A busy week on the data calendar is coming up, as local trade, retail sales and RBA speakers are paired with US trade, unemployment and payrolls data. Continued positivity on the trade front should continue to see the USD under pressure with the AUD likely to test USD 0.74. If you supply Mackay Sugar and would like to do your forward pricing online, please contact us to arrange access to the Pricing Portal.